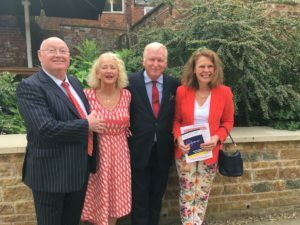 Members of the Rutland Biz Club welcomed Margaret Thatcher’s former private secretary Sir Mark Worthington OBE, as speaker at their monthly luncheon at the Falcon Hotel in Uppingham. Sir Mark, who worked for the former Prime Minister for 20 years, told attendees that Lady Thatcher’s political convictions were defined by her upbringing as a grocer’s daughter in Grantham. It made her who she was – a radical. Attendees heard that Margaret Thatcher was an outsider from the start of her political career at the centre of government, when Britain was economically on its knees in the 1970s as ‘the sick man of Europe’.